As a kid I kept scrapbooks of all the early Mercury, Gemini, Apollo space flights. I could name all the crews. I listened gob-smacked as Lovell, Boorman and Anders – the crew of Apollo 8 – recited from the book of Genesis on Christmas Eve, 1968. Yesterday afternoon at 3:45 PM ET the SpaceX rocket, Falcon Heavy, successfully lifted off from Launch Complex 39A at Kennedy Space Center in Florida. Falcon Heavy is the most powerful operational rocket in the world by a factor of two, with the ability to lift into orbit nearly 64 metric tons (141,000 lb). Elon Musk, founder of the private aerospace company SpaceX, believes this rocket could spell “game over” for his commercial spaceflight rivals. The Falcon Heavy, which will provide the United States a heavy-lift capability in space not seen since the Saturn V rockets of the Apollo era, made a flawless ascent through clear blue skies, with at least two of its three reusable boosters returning safely to earth. Their return was astonishing: like something from an early Thunderbirds episode. The spectacular launch was watched by an estimated half-million spectators who packed the beaches and other key vantage points around Florida’s space coast for the biggest fireworks show since the retirement of Nasa’s space shuttle fleet in 2011. As this is a test flight there is no commercial payload. 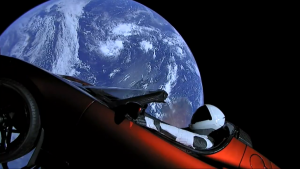 Instead the rocket carried into space Elon Musk’s $100,000 cherry red Tesla Roadster sports car, with a dummy in its driver’s seat called Starman rocking to David Bowie’s Life on Mars. Pictures of the car heading into space with the Earth below gave the triumphant launch a surreal quality. From there, it will journey on through a six-month, 400m-kilometre trip to a solar orbit. Musk hopes the Falcon Heavy will help with interplanetary exploration and assist the mission of NASA, the American space agency, as it works towards a return to the moon for the first time since 1972, and eventually landing humans on Mars before the middle of the century. What a day that will be. “Falcon Heavy heading to space on our test flight, building on the history of Saturn V/Apollo and returning launchpad 39A to interplanetary missions,” a SpaceX announcer said as the rocket lifted off, referring to the historic launchpad at the Kennedy Space Centre from which the first manned moon mission took flight in July 1969. Recycling rockets, Musk said, keeps the cost of a Falcon heavy launch at about $90m, compared with $435m for the launch of a Delta IV Heavy operated by the United Launch Alliance. The Falcon, Musk added, also possessed almost twice the payload capacity of the Delta. The only complication was the loss of Falcon heavy’s third booster, the central core which failed to land safely on a recovery barge in the Atlantic Ocean. Meanwhile, the two side boosters had landed successfully on land at the space centre, marking the 42nd and 43rd time SpaceX had retrieved a booster for reuse. There had been a carnival atmosphere at the Kennedy Space Centre through the day, with Apollo astronaut Buzz Aldrin, 88, the second man to walk on the moon after Neil Armstrong, as a guest of honour. Spectators who paid $195 each for a ticket packed the bleachers at the Saturn V visitor centre and had a clear view of the launchpad across the Banana river just 3.9 miles away. The Falcon Heavy consists of three first-stage boosters like those used by SpaceX’s successful Falcon 9 bound together like pan pipes, with a second stage on the central one. All three boosters are then meant to fly back to the Earth: the flanking ones to landing pads at the Cape, the central one to a barge in the ocean. Mr Musk’s Tesla has a copy of “The Hitchhiker’s Guide To The Galaxy” in the glove box and a plaque stating “Don’t Panic” on the dashboard. Remember this is also the first private payload sent beyond earth orbit—it will be an unprecedented achievement. You can also watch a replay of the test flight live below, as well as a live view of Starman in orbit.